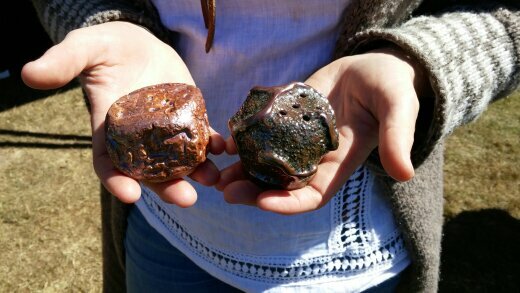 Spoiler warning: this post mentions artistic items people are making for sale -- but they're all about science! This summer I have run into a few people who are inspired by science to make beautiful things. One is a potter looking at living cells through a microscope. One is a graduate student studying Earth Sciences, who inspires kids learning how science and art overlap in this way. And the third is making large pictures showing melting glaciers -- more colourful than you'd think! Carved and stamped by hand, Sydnie’s functional and sculptural work reveals a dedication to detail that bridges the disciplines of craft and science into the everyday world. One particularly charming oval platter is designed to show what a pine needle looks like when you cut a slice across the needle and focus a microscope on the slice. Along with mugs and bowls and plates she makes from clay, Sydnie also has this interesting panel of wall art you can see on the easel behind her, called "Biomedical Artistica." She teamed up with biomedical grad researcher Andrew Agbay for this piece, which shows small spheres delivering medication to the network of living stem cells turning into neurons. This pair of pottery pieces is a particular favourite of hers -- it's salt and pepper shakers, that sit on her dining table. The nifty part is that the salt cellar is shaped like salt crystals are, in a cube. The pepper shaker is shaped like a black peppercorn, round with wrinkles. Charming! I found another science artist, but this time online. Jill Pelto is studying for her Masters degree in Earth Sciences at University of Maine. You can check out her Twitter feed at this link, which shows some of her interesting drawings. "I create field sketches of places I have researched, and environmental illustrations," wrote Jill Pelto on her Twitter profile. Y'see, Jill not only makes drawings in the field when she's out gathering data on glaciers and doing research in places as far away as the Falkland Islands, or New Zealand and Antarctica. 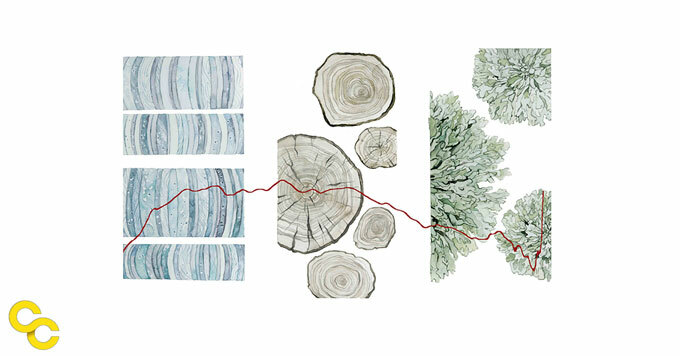 She makes art based on the jagged lines and curves made when her data is printed in a graph. Sometimes a zigzag line will look to her like a melting glacier, other times it will be part of her drawing of a forest fire. 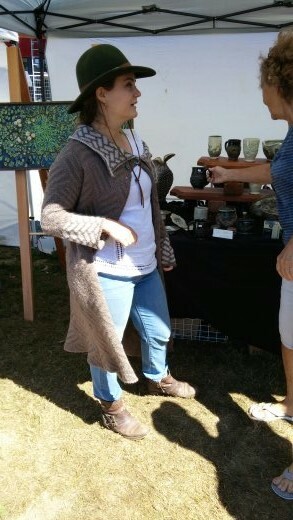 Here is an image of her work "Proxies for the Past" which appeared on Yale Climate Connections website. You can read what they wrote about Jill Pelto and her art at this link. 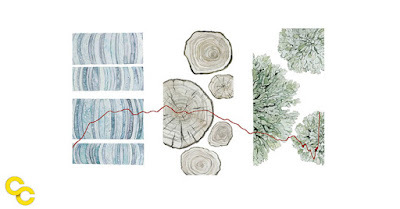 To see more of Jill Pelto's art, check out this link to where she sells some of her Glaciogenic Art, including that image. On Twitter, there's a link to images created by students who were inspired by Jill Pelto's art. It's nice to see emerging art as well as her polished pieces. And if you're a fan of science-inspired art and want to see more, check out the pastel drawings done by Zaria Forman at this link, where she is making a striking series of images based on photographs of glaciers in Antarctica. She makes drawings and paintings using pastels, a chalk-y medium, on large sheets of white paper and large canvases. In the video shown at the link, she is working on a drawing big enough that she is using her fingers to apply the pastels. Melting glaciers means more than just statistics to me when I can see so many shades of blue and white in the ice she draws! It’s hard to say a lot about a book that has only 300 words. It’s elegant. It’s simple. It’s a look at billions of years of Earth’s natural history in 16 images. This picture book is made up of engaging stylized art accompanied by super-simple text with a touch of the poetic. I would love to have a little kid again to read this to. It is accurate, but accessible. Images are full of action. Gladstone wrote about complex things using words are short and common; though a parent might have to explain “evolve,” it is a common word. Sentences hover around 10 words. While this book doesn’t have the resilience of a board book, I’d much rather have read this to my son than Goodnight Moon every night for four years, even before he knew what the words meant. We would look at all the scenes, talking about what is shown, how long a million is, whether humans rode dinosaurs (they didn’t, and the text makes it clear that the two creatures are separated by several pages). We would use the folio at the end to guide discovery of each image, making it a scavenger hunt as we spot more detail. A glossary and list of related websites would help me explain even more and guide that little learner where their curiosity leads. Diemert created the art with ink, collage, and digital media. She made every image active and engaging and full of detail that kids will love to discover every single night. Even the spread showing a dinosaur skeleton in the desert has an active tiny creature kids can imagine a story for. The book leaves us with a sense that though Earth’s journey was long, it’s not over. Little minds will wonder where it might lead, and they’ll repeat the poetic words making them part of the family lexicon. Recommended for kids from 1 to 8. Images from the book reproduced with permission of OwlKids Books. Walking along the steep cliffs of the southwest coast of Rapa Nui, or Easter Island, I gaze down on foaming white waves pounding the shore of a small island: Moto Nui. This is where history was made. The view of Moto Nui from the cliffs of the larger island, Rapa Nui. 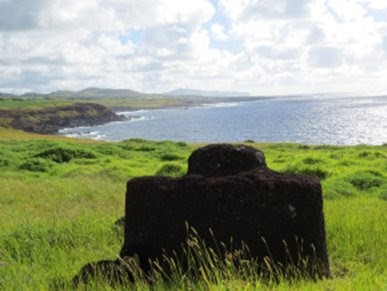 The first inhabitants likely arrived on Rapa Nui in wooden canoes from far-away Tahiti. From these first few grew a population of thousands. But European diseases and fighting reduced their numbers to a low of 110 at one point. 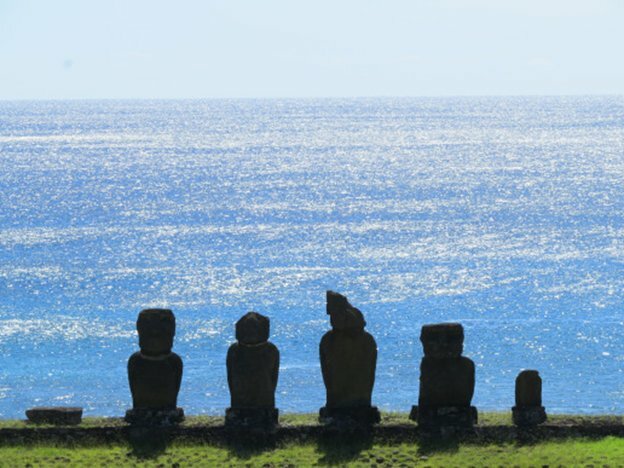 After the era of the moai (stone figure) carving culture, competing tribes designed a non-violent way to establish order on Easter Island: the Birdman Cult. 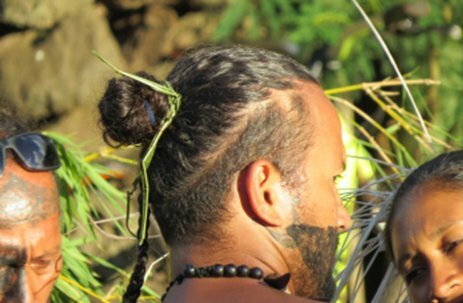 Chosen young men competed for the right to have their tribe rule for the next year, until the next competition was held. 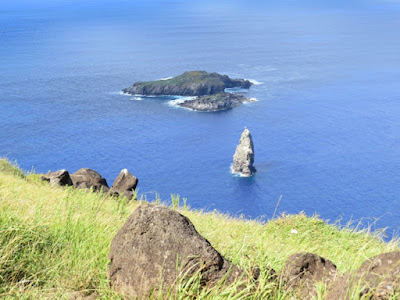 The competition was held near the most important site on the island, the Rano Kau volcano, and consisted of climbing down the steep rock face of Orongo to the wild ocean below, building rafts from reeds, using these as flotation devices and swimming the rough kilometre-wide passage of pounding ocean to Moto Nui island. The young men had to bring back the first egg laid by birds returning in spring. They tucked this egg into a woven headband, swam the ocean and climbed the cliff to hand the egg, unbroken, to the chief. I saw tiny rock houses at Orongo and scattered rocks carved with birdman and boat pictures. We climbed the sides of the ancient volcano to look inside the crater, filled with shallow lakes where drinking water was collected and reeds for the rafts were cut. 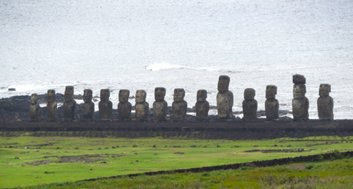 The best came last, when we visited the site famous from so many photos – the long row of moai standing shoulder to shoulder. 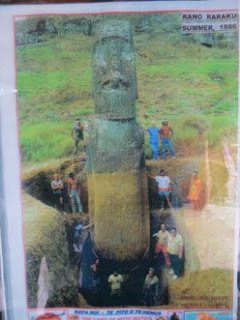 This is iconic face of Easter Island. But my favourite site is the quarry. When I first heard the name, I pictured a rock excavation site where rocks were dug up. However, when you approach the quarry, it is as if the stone people have come to life and are walking out of the mountain from where they were born. 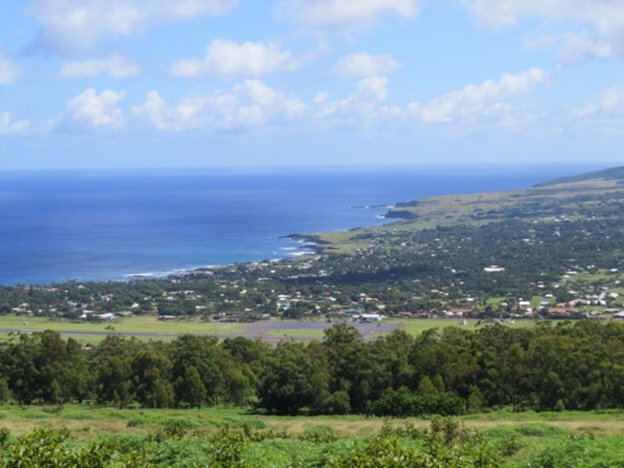 A gently sloping green side of a volcano is scattered with upright figures. They seem to be walking down, stumbling and standing all over the slopes. The sight gave me goosebumps and a lump in my throat. 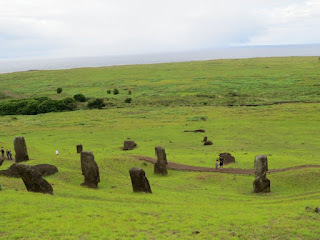 The moai were carved here from gigantic blocks of basalt and lava. 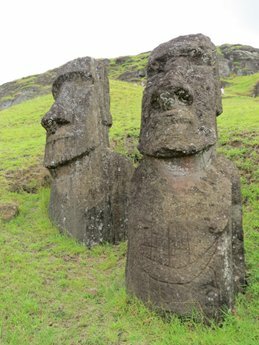 Weighing many tons and measuring up to ten metres in height, their individual features were carved. I had heard that most figures only show the upper body while the lower half is still buried. 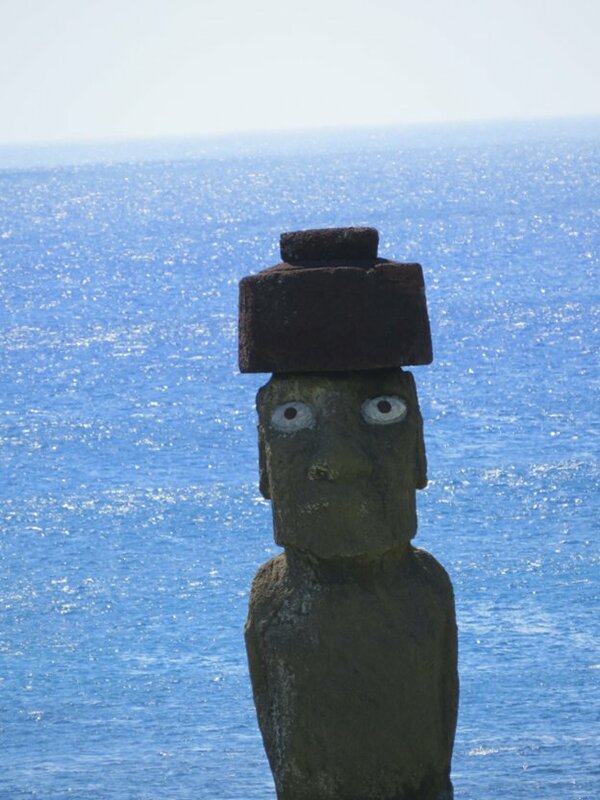 Before I saw them, I thought that this meant that the moai had been covered by drifting sand over the ages. But that is not true at all. There is no sand. Only lava and rocks. The artists did not have ladders, so they dug deep pits in which they lowered or raised the moai until they could reach their faces to carve them. 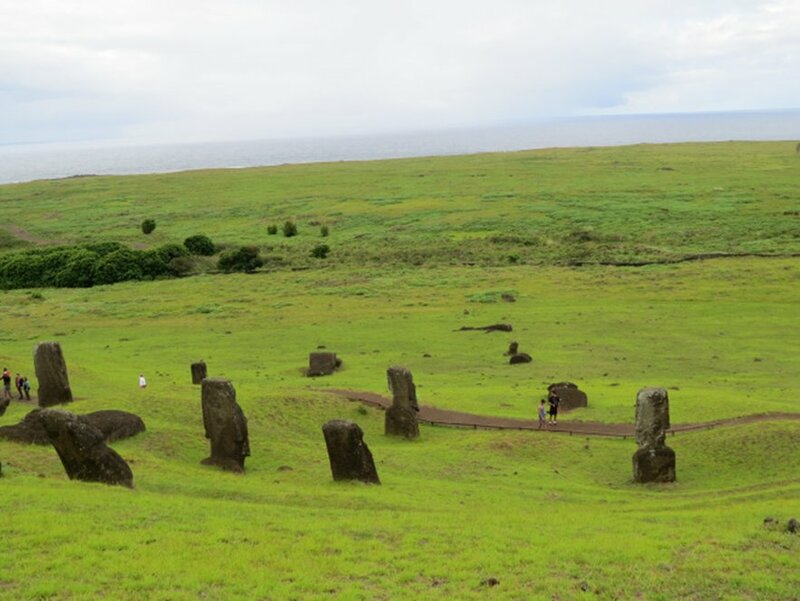 Once a figure was finished, it was erected and “walked” down the mountain to spots all over the island – a mind-boggling feat that National Geographic has tried to recreate. Why did people stop carving and moving the figures? It seems like they were in the middle of ongoing projects when work came to a halt. No one knows why. Why did the Rapa Nui create these statues in the first place? 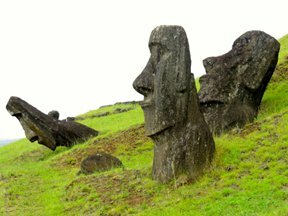 Scientists believe that well-to-do families ordered a moai in memory of an important member of the community. 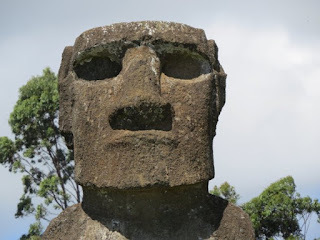 When this person died, male or female, a moai was constructed in his or her image and erected over their bones. Once the grey basalt figure, with or without red lava topknot, had been given white coral eyes with a black obsidian center, it was believed that the deceased person’s spirit had entered the moai and would now protect Rapa Nui and its future generations. All photos by Margriet and Kies Ruurs. For more of the Ruurs's travel adventures, visit their blog, Globetrotting Grandparents. In light of the current discussions around falling math scores in Ontario, I am reminded of how much these comments from kids - and, even more so, from adults - drive me crazy! It’s not because I think everyone should like math or be good at it. It’s because the speakers are treating math as one huge monolithic subject instead of many fascinatingly interconnected strands. Contrast this with our attitude to English literature. If a student loved short stories and poetry but was left unmoved by plays, would we say that she/he didn’t like English? No. If a winner of the $65,000 Griffin Poetry Prize was incapable of writing a science fiction novel, would we say they were “not good” at English? Hardly. But we allow ourselves to think we aren’t good at math or don’t like it if we aren’t accomplished at every aspect. This gorgeous image is math - an algebraic fractal called a Mandelbrot set. like this Mandelbrot set, may look wild but are still symmetrical at heart. I used to be as guilty of this as anyone. Going through school, I had very different impressions of my ability in math, depending on what subjects we were learning. I eventually discovered that my lack of enthusiasm for division didn’t arise from missing 40 days of school in Grade 4. In fact, it is not uncommon to find addition and multiplication easier than subtraction and division. 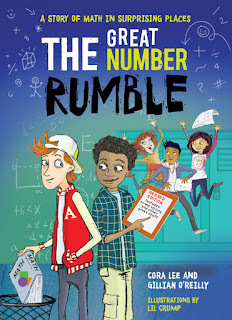 I loved math the years I encountered geometry (nothing like encountering math with letters to make a bookworm like the subject) and algebra (reducing an unknown to one possible answer intrigues a mystery lover). Fortunately, while other years weren’t so positive, I managed to retain a fondness for the weird, the cool and the paradoxical in math. 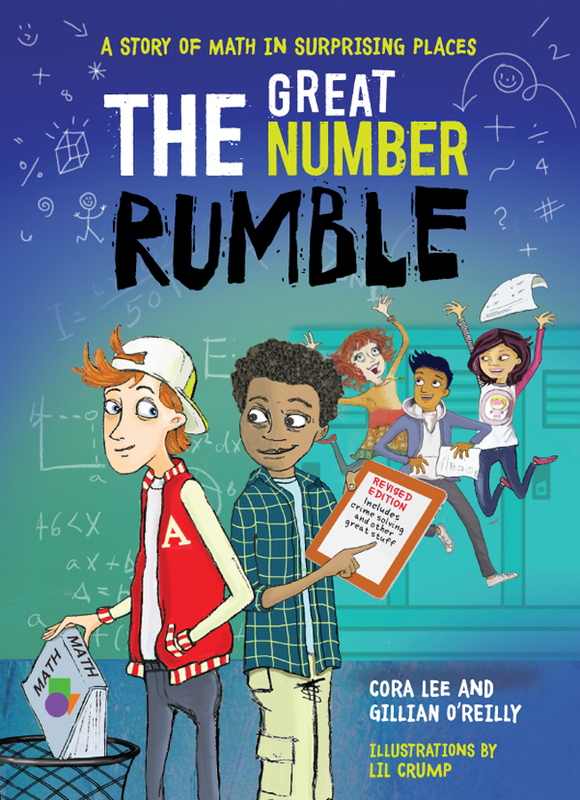 When Cora Lee and I wrote The Great Number Rumble: A Story of Math in Surprising Places (Annick Press), we both wanted young readers to find that same pleasure. 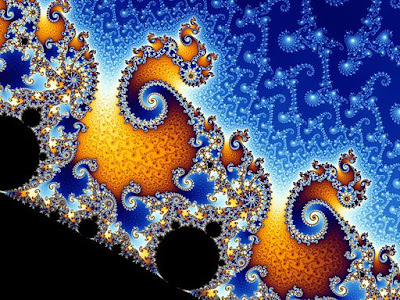 It didn’t matter whether they found it in fractals or Fibonacci numbers, topology or tessellations, or in the semi-prime numbers which I find inexplicably cool. All that mattered was that they found some part of mathematics to engage them. Good news, science fans! Actually, three pieces of good news. It's Science Literacy Week here in Canada. Our own Sci/Why writer Simon Shapiro is receiving an award on Wednesday Sept 20th, 10:30 am at the Ontario Science Centre for his book Higher, Faster, Smarter. Hurray for Simon! And, hurray for all us Sci/Why writers, because our blog Sci/Why has been named to the Top 12 Short List for People’s Choice Award: Canada's Favourite Science Blog. 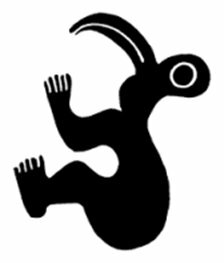 Starting today, Tuesday September 19th, Science Borealis website is hosting the voting, allowing people who love to read about science online to vote for the sites they like the best. Voters will be asked to select their THREE favourite science blogs and science sites (so 6 votes total). The site and the blog with the most votes will each win People’s Choice: Canada’s Favourite Science Online! Between September 19th and close of voting on October 14th, Science Borealis and the Science Writers and Communicators of Canada will promote the nominees across their social media channels. Look for the Twitter hashtag #CdnSciFav and for #scilit17 during Science Literacy Week. After the close of voting, 3 finalists for each category will be announced via social media during the week of October 23. Winners will be announced at the Canadian Science Policy Conference (Nov 1-3) and simultaneously via social media. It looks like a great way to celebrate Science Literacy Week and Sci/Why's writers is to vote for the People's Choice Awards. I usually live a peaceful, semi-rural life on a small island in the Salish Sea. There are plenty of animals in and around the island, both wild and domestic, but our particular patch of island rarely features anything much bigger than a hummingbird. And, admittedly, the occasional passing raccoon or river otter, but we discourage them. They tend to leave smelly presents behind. This week, however, I'm in the city - smack in the heart of Victoria, British Columbia. 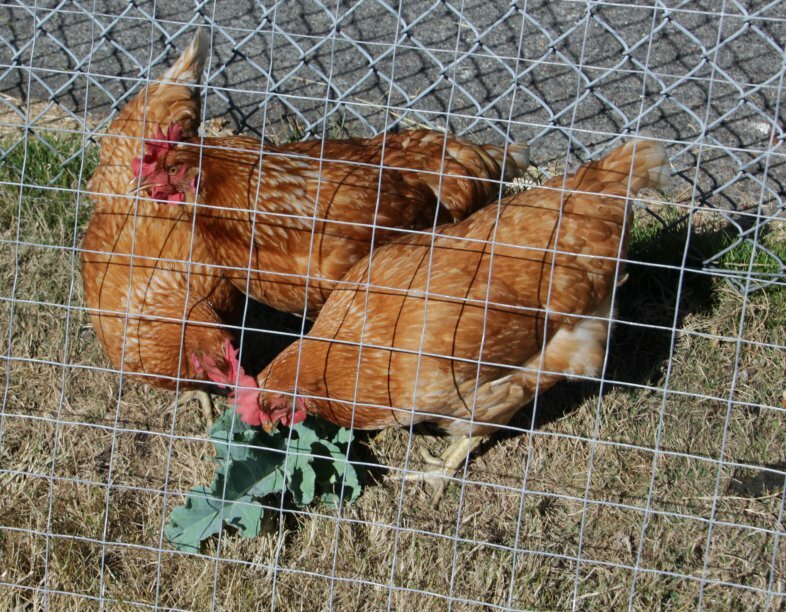 I'm helping out some absent friends by taking care of their chickens. Chickens. Three of them. In the city. Honest! City chicks Inky, Pinky, and Ponky gobble down a delicious broccoli leaf. Now, in fairness to my friend, these chickens don't wander through the house like the ones in the article. Inky, Pinky, and Ponky have their own very pleasant accommodations in the yard, opening into a well-fenced run. They pay the rent with three fine fresh eggs a day, which both sides consider a fair deal. Getting to know the girls got me curious about chickens in general. I had researched them several years ago for my book about the science and history of food, The World in Your Lunch Box, but I thought I'd take another look. And here's a bit of what I discovered. inner dinosaur. Claire Eamer photo. Domestic chickens are descended from red jungle fowl, a bird species found in southeast Asia. Of course, over millennia of domestication, humans have bred and modified them into a huge variety of colours, shapes and sizes. And just as huge numbers. There are more chickens than any other bird species in the world - and more than there are humans. A 2009 United Nations report estimated that, on average, there are three chickens for every human on Earth. 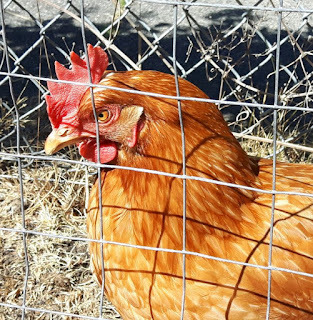 Chickens aren't the peaceful seed-and-chickenfeed-eaters you might imagine. They'll happily chow down on insects too, as well as small lizards and mice. After all, chickens are the little modern cousins of dinosaurs - and if you look closely, you can see the resemblance. Chickens' ability to produce eggs reliably and frequently (one a day each from Inky, Pinky, and Ponky) is impressive. That's a lot of energy and chickenfeed going into egg production. Here's a short video that explains how it works and how long each step in the process takes. Surprisingly (to me, at least), making the shell takes up most of the day - 20 hours out of 24. And then we break the shell and throw it away. Sorry, girls! If you want to know more, check out this collection of fun facts about chickens from the Smithsonian.